Kate Spade is a household name- synonymous with preppy, vibrant, high-end fashion. Known for their playful prints and youthful sophistication, Kate Spade’s catch phrase is “live colorfully”. Founded in 1993 by Kate Brosnahan Spade in New York, the brand has since branched out into so much more than just handbags. Currently, the Kate Spade label designs handbags, clothing, jewelry, fashion accessories, fragrance, eyewear, shoes, swimwear, stationery and more! Kate Spade is truly a ‘global lifestyle’ brand. Their products are popular and sold in stores worldwide, and you can shop more than 140 Kate Spade stores in the U.S. alone. Their products are an eye-catching status symbol. One can expect high-end taste and quality in all Kate spade products. “How do you empower a community? Empower the Women in it.” – Kate Spade. Beyond being a design powerhouse, Kate Spade is also focused on philanthropy and empowering New York women. Through the Kate Spade & Company Foundation, the brand is dedicated to helping women find a trade that they can use to support themselves and positively impact their community. With a three pillar approach, the Kate Spade & Company Foundation seeks to launch women in entrepreneurship, technology and the arts. If you enjoy our Kate Spade Cedar Street Maise Review and want to find out more about similar products or the brand itself, we highly recommend that you visit their official website. It has an abundance of information about the various Kate Spade collections and myriad of products. The Blog section is visually stunning and inspiring. It features grantees of the Kate Spade & Company Foundation program which commits $1 million each year towards promising New York women in entrepreneurship, technology and art. Videos on the blog give snapshots of these women and their projects. The blog also has a fun ‘behind the curtain’ section that gives away sneak peeks of upcoming lines and designs, for those who like to be one step ahead of the fashion curve. You can also peruse blog posts on DIY, decor, travel and entertaining- lifestyle tips to ‘live colorfully’! The official website is the best place to get all access to every creative Kate Spade product. Whether you’re looking for new arrivals in handbags, bridal jewelry, or home decor, the official website is the best for authentic and unique Kate Spade products. Women know that the perfect handbag will make or break any outfit. The Kate Spade Cedar Street Maise is the handbag that will pull together a perfect outfit! It’s on-the-go, carry-everything design has quickly made it one of Kate Spade’s most sought-after styles. Off Shore – An absolute classic in an inky black. For those who enjoy simplicity and a clean look. Emperor Blue – A timeless, regal look for the shopper who wants a color that radiates elegance. Grace Blue – A retro-inspired, teal-blue color that evokes a youthful, care-free feeling. Mahogany – A stunning, rich color that makes a statement about professionalism and class. Mulled Wine – This deep, unique color offers a distinguished and polished look, in a mature, neutral color palette. Pink Bonnet – A spring-inspired, bubble-gum pink that is flirty and fun. Pink Confetti – A bold, stand-out, stunning color that is sure to attract attention in the best way possible! Sky Blue – This strikingly crisp blue hue conveys serenity and confidence. Sweetheart – A shockingly pink color tone that’s as fun to wear and as a bright, bold lipstick. The look and design of the handbag will stay the same no matter which color you select. For a handbag that comes in so many amazing colors, you might have trouble choosing just one! 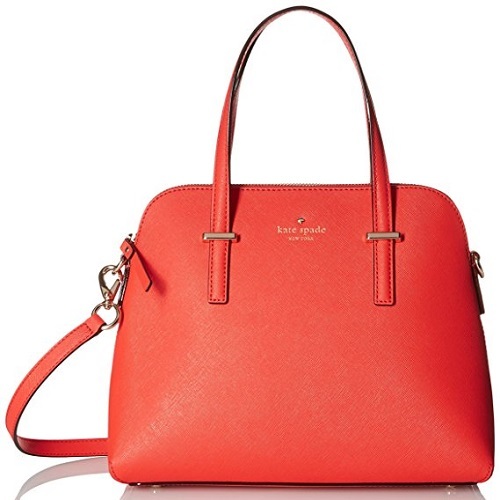 The Kate Spade Cedar Street Maise comes in just one size. It is a mid-size handbag; larger than clutch, so you can carry all your essentials- phone, wallet, make-up, etc. It’s slim strap is flattering across the body. It has a wonderfully sleek shape that is eye-catching in the best way. 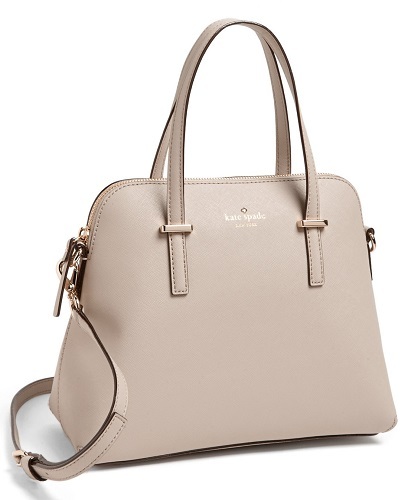 The Kate Spade Cedar Street Maise is the epitome of luxury fashion. With crosshatched leather, 14-karat gold plated hardware, and signature polka dot lining, this handbag is stylized beautifully down to every last detail. Kate Spade does not disappoint when it comes to designing the new must-have handbag. We also love that this satchel is adaptable- it can be carried on the arm with top handles, on the shoulder, or casually as a crossbody with its convertible crossbody strap. This design feature multiplies the potential use of the of the bag for different looks and functions. The Overall Rating for Style and Design of the Kate Spade Cedar Street Maise is 5 out of 5 stars! The unexpected spectacular level of comfort the Kate Spade Cedar Street Maise provides is like icing on the cake for this unique handbag. One might imagine that a leather satchel that can hold all your essentials would feel heavy and uncomfortable. But on the contrary, the Kate Spade Cedar Street Maise offers a different experience thanks to some very thoughtful design elements from a team of experienced designers who are clearly designing for the on-the-go, young professional woman. The Kate Spade Cedar Street Maise is designed to be carried three ways: on the arm, on the shoulder, or across the body. Everyone woman has their own personal preference to what feels right when it comes to carrying a handbag, and Kate Spade has taken this into account in the design of their satchel. Built to be fully adjustable to fit the length of your torso and carry your items with equal weight, the satchel provides unparalleled comfort for your day-to-day wear. The convertible crossbody strap allows you to create a custom fit that is perfect for your size and shape. Adjust it to wear the Kate Spade Cedar Street Maise comfortably on the shoulder or across the body. 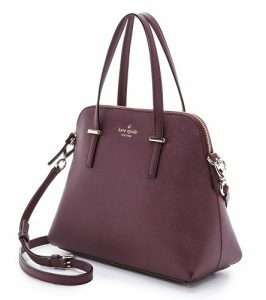 For the woman who prefers to carry her bag on her arm, the slim top handles of the Kate Spade Cedar Street Maise offer top-notch comfort. No need to worry about thick, heavy handles digging into your arm! This feather-light handbag will feel as good as it looks on your arm. 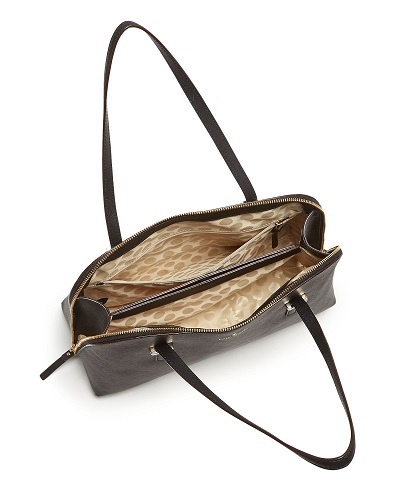 Finally, the Kate Spade Cedar Street Maise is truly the perfect sized handbag to maximize comfort. It’s the goldilocks of handbags- not too big and not too small. It’s functional size makes it practical while putting comfort first. The Overall Rating for Comfort of the Kate Spade Cedar Street Maise is 5 out of 5 stars! Every detail of this handbag is well designed to be light, modern and multifunctional. It’s adjustability makes it possible to practically custom fit anyone’s size or build. You will immediately notice how polished and well-crafted the Kate Spade Cedar Street Maise feels the moment you try it on. This remarkable handbag is made up of several different high-quality materials to make it last for years worth of everyday wear. The body of the satchel is made of a premium quality cross hatched leather material. Sometimes called saffiano leather, this material is durable, practical, and easy to clean. Made from calfskin, this beautiful textured leather has a protective wax finish. The special finish improves the durability of the bag, as it works to prevent scratches and cracks in the leather. The Kate Spade Cedar Street Maise has another major advantage in durability- besides being scratch resistant, it is also water-resistant! The wax layer creates a protective surface that water droplets can’t absorb into. Your luxury leather bag won’t be ruined if you get caught in the rain! Or if you have a wine spill, simply wipe gently with a clean cloth, and any stains can be avoided. To top it off, Kate Spade offers their handbags with a one year warranty for additional peace of mind! For fashion-conscious shoppers who strive to find excellence and durability in a high-fashion handbag, the Kate Spade Cedar Street Maise delivers. For all it’s elegant beauty, you will get a long-lasting leather handbag you can count on. Incredibly damage resistant, the Kate Spade Cedar Street Maise will stay with you for years of fashion statement making. The Overall Rating for Durability of the Kate Spade Cedar Street Maise is 5 out of 5 stars! We have already covered several of the key features in this Kate Spade Cedar Street Maise review, but going over the entire list will be beneficial to those of you seeking certain specifications. Every woman has a certain qualities that they desire in a handbag- we bet the Kate Spade Cedar Street Maise will meet your expectations! Kate Spade exceeds all expectations in features of comfort, surprising even the most picky handbag lover. It’s durability and convenience for easy cleaning, due to the crosshatched leather material, make it incredibly functional and a spectacular buy. For all it’s thoughtful design details, The Kate Spade Cedar Street Maise lacks a couple noteworthy features that many shoppers look for in a handbag. For example, there is no outer or front pocket for quick and easy access to most-wanted items. One other small complaint is that the top access of the bag can be tight, not opening as wide as one might like. For these reasons the Overall Rating for Features of the Kate Space Cedar Street Maise is 4 out of 5 stars! The Kate Spade Cedar Street Maise handbag is one of Kate Spade’s best sellers. It has been a staple product in their handbag collection, and it’s clear why – the combination of quality design and durability in a luxury handbag such as this one are truly rare. The price is quite reasonable for the impressive quality of the product. You are making an investment in a classic, statement handbag that can last you for years. Coming in at a higher dollar price-point, it’s not inexpensive, but this is really a case of getting what you pay for. The Kate Spade Cedar Street Maise materials are ultra durable and you’re also paying for the brand and status symbol that comes along with carrying a Kate Spade bag. The design of the handbag is very elegant and modern for those who prefer a classic, go-with-any-outfit style. Variety – All nine color variants are to die for! We love how many stunning choices Kate Spade offers you. You can definitely channel your personality through one of these beautiful hues. Express yourself and live colorfully! Functionality – The Kate Spade Cedar Street Maise can be worn three ways. We love the options this gives the buyer to customize the handbag to their personal style and comfort level. Timeless – The clean, modern shape and lines of this handbag are incredibly classic. From a mile away, you can spot it as a luxury bag. The Kate Spade Cedar Street Maise will not be outdated or out of style next season or even next few years. It’s effortless design has staying power! 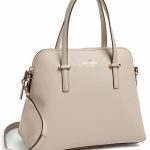 Warranty – All Kate Spade handbags come with a one year warranty! Access – The only real complaint we can make about the Kate Spade Cedar Street Maise is that it only offers one main access area- no small front or back outer pocket – and that top zip is a little tight. The handbag itself is pretty roomy, if you can navigate the top zipper. 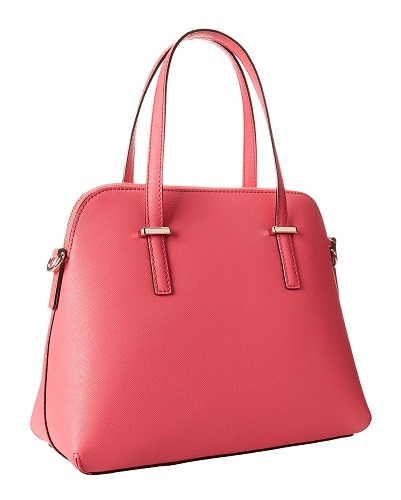 The Kate Spade Cedar Street Maise is an impressive, top-of-the-line luxury handbag. This style is a Kate Spade favorite because of its high quality materials and modern, sleek design. Now shoppers don’t have to choose between an arm, shoulder or crossbody bag. With the Kate Spade Cedar Street Maise, you can have it all! If you are looking for youthful, easy elegance we think this handbag is definitely worth your investment. We give the Kate Space Cedar Street Maise an Overall Rating of 4 out of 5 stars!